Click Here to Book a Private Ice or Rock Climbing Trip Today! 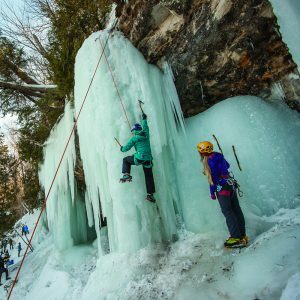 Starting in the early 90s, the Michigan Ice Fest has been a place for ice climbers to meet, climb, and socialize in Munising Michigan. The spectacular ice in Pictured Rocks National Lakeshore draws climbers from around the world to the festival making it one of the largest gatherings of ice climbers in the world. Around 2015, as the festival grew and more climbers learned about the ice in the Munising area, we started getting requests for trips outside of the festival weekend. People who couldn’t make the festival due to scheduling issues, but still wanted to experience ice climbing, or people who wanted a trip that was a little more intimate, reached out and our guide service was born. Being year round climbers, it was natural to offer summer rock climbing trips as well. Having guides throughout the Upper Peninsula we have an intimate knowledge of all of the available climbing areas and can create fun, memorable experiences throughout the peninsula. We pride ourselves on having the best trained and most experienced guides in the area with decades of combined guiding and teaching experience. A focus on safety, education and adventure help make us one of the midwest’s premier climbing guide services. Contrary to popular belief, you do not need to have tremendous upper body strength to be able to climb ice. The skill requires balance and efficient technique which our guides will provide during our informative ice climbing courses. The MIFG’s offer a wide range of guided trips to suit the needs of our clientele. From the classic front country climbs to the wild backcountry ice routes, there are ample opportunities for beautiful climbs to test your ability and experience the Upper Peninsula’s winter wilderness. Course locations will be determined the day of your guided climb and will be determined based on weather and ice conditions. Our guided rock climbing trips are a great way to experience the amazing summer in Michigan’s Upper Peninsula. Beautiful scenery and fun adventure will help you create memories you will never forget! Our rock climbing locations are located in Marquette and in the Keweenaw Peninsula. We offer a variety of trip options and locations to help you have a perfect day. Whether you are a first time climber looking to try something new, an avid gym climber looking to take your skills outside, or a seasoned adventurer just looking for some local guidance, we can guarantee a great experience.